Cape Hatteras Light is a lighthouse located on Hatteras Island in the Outer Banks of North Carolina near the community of Buxton, and is part of the Cape Hatteras National Seashore. At a height of 200 feet, it is the 23rd tallest traditional lighthouse in the world. The climb is strenuous! The 248 iron spiral stairs to the top equal climbing a 12 story building. 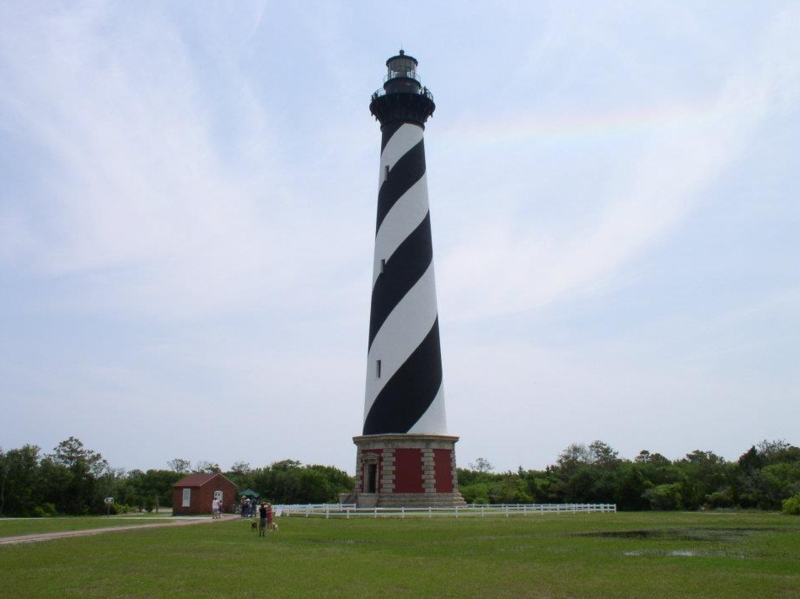 The first Cape Hatteras lighthouse was built in 1802 and lit in 1803. The current Cape Hatteras lighthouse is America's tallest lighthouse at 198 feet high. It is also the worlds tallest brick lighthouse. The Cape Hatteras lighthouse has 257 steps leading to the top. The beacon light can be seen for 20 miles out to sea. It took 1.25 million bricks to build the tower and if you laid each brick down, one-by-one, they would extend from Corolla to Ocrcoke Island - over 100 miles!